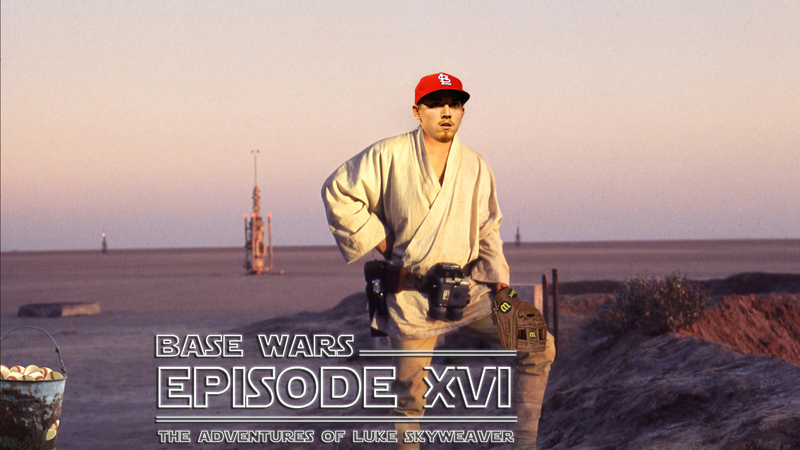 The next morning, Shildt comes into the clubhouse to find Bryan Eversgerd working with some other pitchers. I don’t know. He said something about doing some extra workouts, maybe running a bit through town. Well, as long as he’s back by first pitch. He take those new droids with him? Think so. They aren’t around here anyway. Luke, driving his speeder with Eugene in the passenger seat, has found Oh on the outer reaches of the PCL Sea. As they catch up to him, they are set upon by Zephyrs from a nearby settlement. It seems like our hero will be doomed to arm surgery or worse when a loud keening cry echoes through the canyons. The Zephyrs scurry away and a hooded man leans over Luke, checking on his injuries. He spots Oh cowering to the side. Well, hello there! Oh, don’t worry, he’ll be all right. Might need a cortisone shot, but he won’t lose any ribs or anything. By this time, Luke is groggily coming to his senses. Chris? Chris Carpenter? Boy, am I glad to see you! Easy now, you’ve had a busy day. The New Orleans Wastes are not to be traveled lightly. What brings you out this far? (indicating Oh) This droid. Says he belongs to an Ace Carpenter. Ace Carpenter. Now that’s a title I’ve not heard in a long time, a long time. My manager seemed to think he was dead. Oh, he’s not dead. Not yet, anyway. And I’ve got half a mind to go and show that Shildt just how not dead. Of course I know him, he’s me! I’ve not gone by the title of Ace since, well, before your career started. A distant noise, like the stomping of feet against metal, focuses their attention. We should be going. The Zephyrs are easily startled, but they’ll soon be back, and in greater numbers. Carpenter, Luke, and the droids return to Carpenter’s sparse hovel, far out in the desert. After checking on the droids, Luke turns to the matter at hand. You fought in the Red Wars? Yes, I was once an Ace starter. For over a hundred years, the Ace starters were the guardians of the Republic. Before the dark times. Before the Empire. Which reminds me, there was something I was supposed to teach you when you were older. Command is what gives an Ace his power. It’s an energy that is created by work, repetition, and 40,000 fans. It binds the galaxy together. Oh brings the attention to him, speaking in his native language. I saw part of the message he was….. The hologram flickers to life, projecting a small John Mozeliak on the floor of Carpenter’s abode. Years ago, you served my team in the Red Wars. Now I beg you to help us again in our struggle against the Empire. I regret that I am unable to present my request to you in person, but our rotation has come under attack and our attempt to reach Central is severely imperiled. This is our most desperate hour. Help me, Ace Carpenter, you’re my only hope. The hologram disappears, leaving Carpenter in deep thought. Finally, with a gleam in his eye, he turns to his guest. You must learn the ways of Command, if you are to come with me to Central. Central? I’ve got to get home to Memphis. I’ve barely gotten settled here! I need your help, Luke. He needs your help. I’m getting too old for this sort of thing. Look, I can’t get involved. I’ve got work to do. It’s not like I like the Empire; I hate them, but there’s nothing I can do about it right now. My manager. How am I ever going to explain this? Look, I can take you as far as September. From there you can get you a transport to Wild Card or wherever it is you’re going. The scene shifts to an exterior shot of a large spherical ball floating in space. It’s the Empire’s newest and greatest weapon, the Series Winner. We move inside to a large conference room with a number of Chicago personnel around a table. Until this battle station is fully operational, we are vulnerable. The St. Louis Republic is too experienced. Their devil magic is more dangerous than you realize. 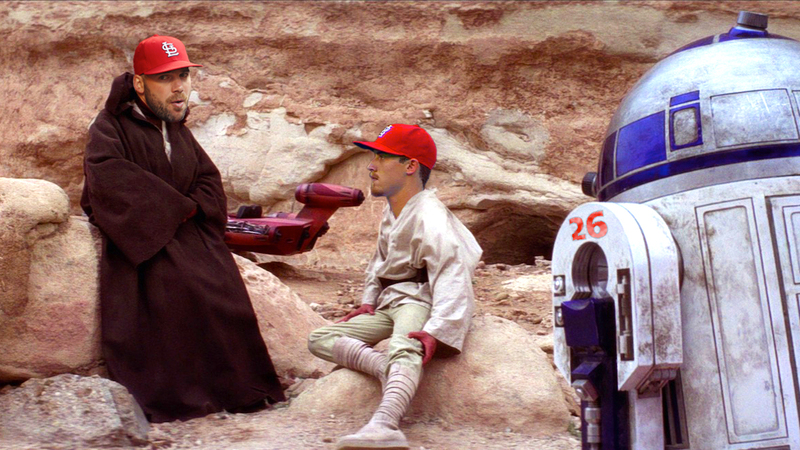 Dangerous to your pitching staff, commander, but not to this battle station. Joe Maddon (Grand Moff Tarkin) and Anthony Rizzo enter the room, silencing the crosstalk between the coaching staff. The Republic will no longer be a threat to us. I’ve just spoken with Emperor Epstein. It is only a matter of time before their holdings are ours. The last remnants of their success will be swept away. But how will the Emperor control the league? Fear will keep the league in line. Fear of this battle station and the team that crews it. And what of the Republic? If they’ve got solid scouting reports it’s possible, however unlikely, that a weakness can be found. The reports that you refer to will be soon be back in our hands. Any attack by the Republic against this inevitability would be a useless gesture, no matter what scouting reports they may have obtained. This station is now the ultimate power in the league. I suggest we use it. Don’t be too proud of this technological terror you’ve constructed. The power to put a team together is insignificant next to the power of our bats. Rizzo starts striding toward Hoyer with a bat in his hand. …or given you clairvoyance enough to find the Republic’s hidden fort…. Rizzo begins swinging his bat inches over Hoyer’s head, coming lower each time. Hoyer holds his breath, unable to continue or breathe. I find your lack of respect disturbing. Rizzo puts the bat away. This bickering is pointless. We will crush the Republic with one swift stroke. Back on Minorine, Luke’s speeder pulls up to a scout transport that has been devastated. The scouts have escaped, but wreckage is everywhere. I’ve never heard of Zephyrs hitting something this big before. They didn’t, but we are meant to think they did. These tracks are side by side. Zephyrs ride on a single animal because they can’t afford more than one. These are the same scouts that brought us Oh-two and Eugene. And these blast points. From much too far away for Zephyrs. Only Imperial batters can bomb from that distance. But if they traced the droids here, they may have learned where they are now. Which would lead them….the stadium! Wait, Luke! It’s too dangerous. Unheeding, Luke floors his speeder back to Memphis. As he pulls up, smoke billows in the distance. Signs on the dugout scream “Season Over” and “No Baseball Here” as everything has been gutted of life. Luke sits and ponders this for a while, then returns back to where Chris and the droids are cleaning up the scout area. There is nothing you could have done, Luke. Your season would have been over as well and these scouting reports would be in the hands of the Empire. I want to go with you to Central. There’s nothing here for me now. I want to learn the ways of Command. Chris claps him on the shoulder and they head to the speeder.